Buy the ebook now!Buy direct from WMG! USA Today bestselling author Dean Wesley Smith brings back the Slots of Saturn in this short novel from the popular series featuring the superhero Poker Boy. Poker Boy and his team destroyed the Slots of Saturn. They know they did. At least, they think they did. 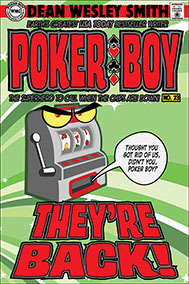 But when people begin disappearing—again—poker boy must face what might just prove his greatest foe. Now, Poker Boy and his team must use their ten years of experience to find a way to conquer the evil ghost slots once and for all. And not lose themselves in the process.